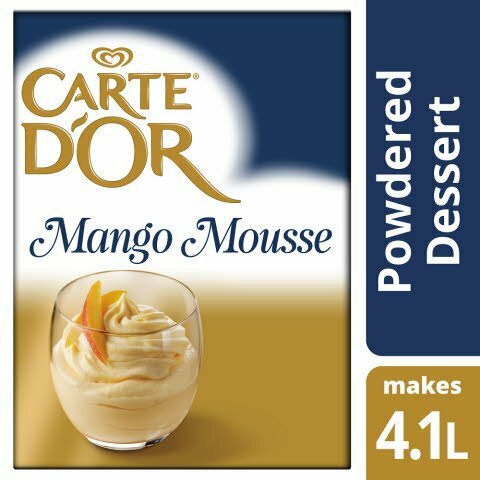 Sugar, dried glucose syrup, palm fat fully hydrogenated, emulsifiers (acetic acid esters of mono- and diglycerides of fatty acids, monoand diglycerides of fatty acids), modified potato starch, maltodextrin, pork gelatin, pea starch, MILK protein, mango powder (1.6%), acidity regulator (citric acid), stabiliser (potassium phosphate), turmeric, flavourings.May contain gluten, egg, soy, nuts. Based on 1 sachet 190g for 0.5 litre of cold milk. 1. Pour the cold milk (whole or semi-skimmed) into a bowl and add the mousse mix. 2. Whisk with an electric mixer for 2 minutes at low speed followed by 5 minutes at high speed. 3. Portion with a piping bag and refrigerate for at least 90 minutes before serving.